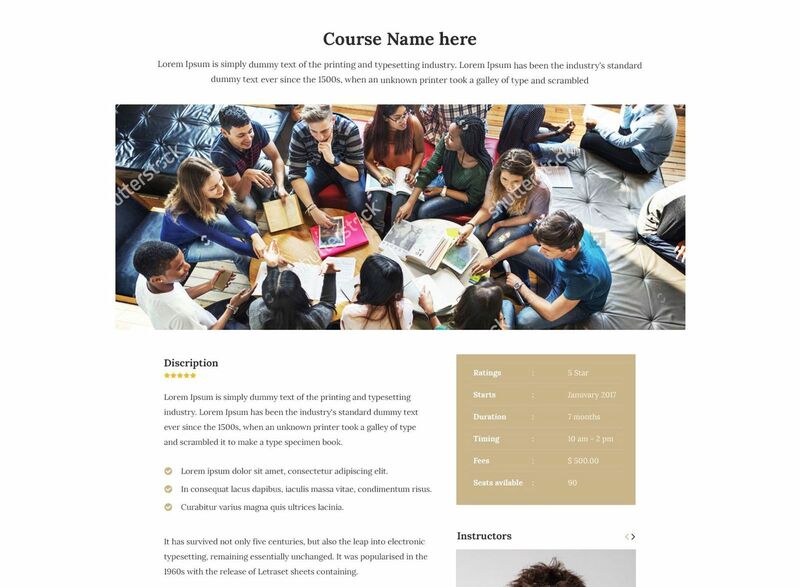 Unisco Education WordPress theme is a creative, modern and minimal education WordPress them for school, college, and university. It can also be used for any other businesses or services. 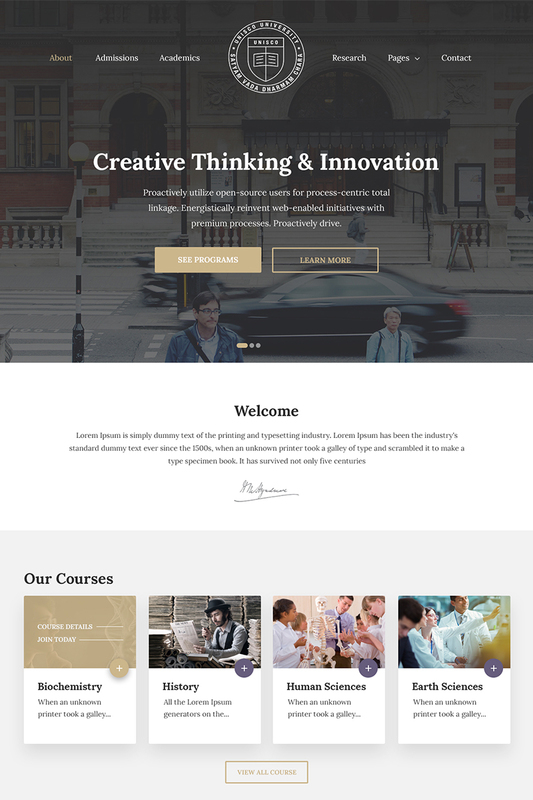 Unisco is a perfect website template for your education-related business. It comes with all features with an option to customize easily as per your needs. Built-in COURSES, ADMISSIONS and EVENTS functionality. Unisco comes packed with courses, admissions and events functionality. You can allocate seats to a course and also accept admission requests. Allocated seats count on every course page is automatically adjusted based on accepted admissions to a course. 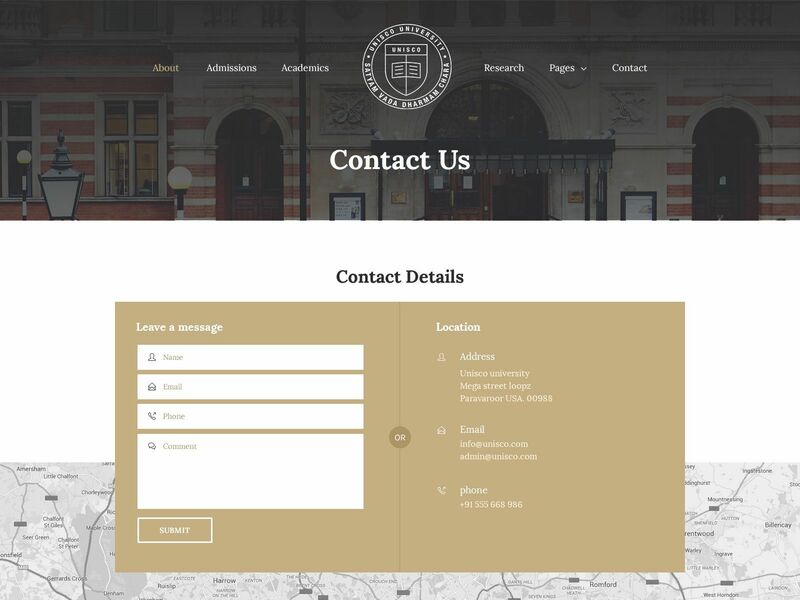 We have created custom forms for admissions and contact messages. Create any color skin with ease using the options provided in WordPress Customizer. Unisco supports download buttons out of the box. So providing course-related documents is a piece of cake. Unisco allows you to specify a different menu for different post and page. Unisco is completely ready to be translated into your language (.mo and .po files are included). Unisco Education WordPress Theme can be used for schools. There are dedicated admission forms and course details page which are perfect for any kind of schools. Colleges or educational institution can make use of Unisco Responsive Education WordPress theme. Your website will work seamlessly on any mobile or tablet devices. Creative and easily Customizable Design. No complicated frameworks? if you need to do advanced changes it will be easy. Demo content included so you can get up and running like the demo site in no time. 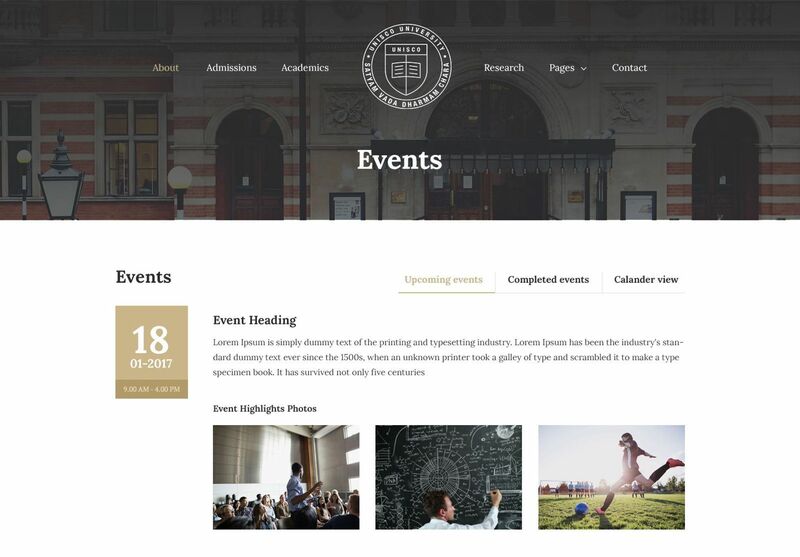 Courses, Admissions and Events functionality baked in. Customized admission form functionality. No plugin needed! Custom made contact form functionality. No plugin needed! Full Calendar (Google Calendar) view for Events. Detailed theme documentation is included with the download package. Theme Documentation is also available online â€“ https://snapthemes.io/docs/. 24Ã—7 Support is provided to all customers who have purchased the theme. Notes: Some images used in this theme are only for demo purposes, thus not included with the purchase. excellent them, very quick and easy to set up, I would recommend if its being used for courses or night classes. Template Monster doesn&#039;t disappoint! That&#039;s why I only buy my templates from them. They can used in so many different ways. The code is always well written and easy to manipulate. 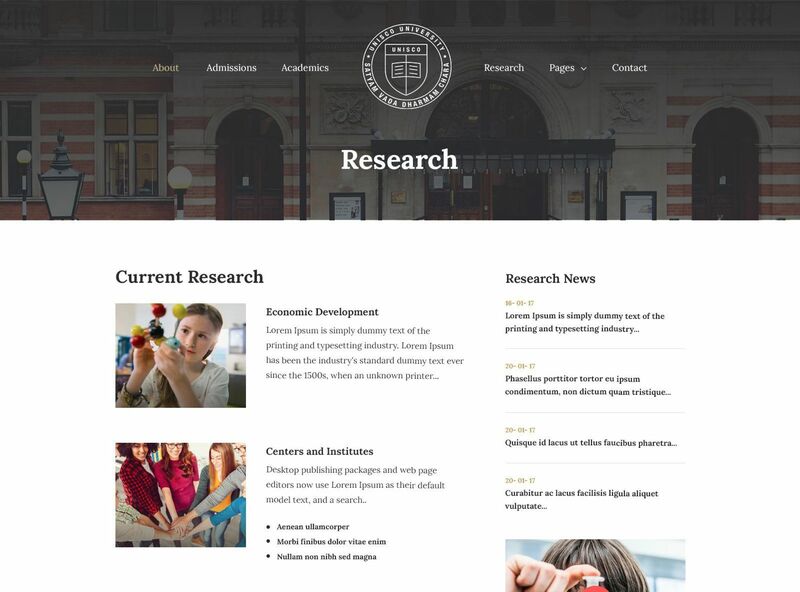 Aquite good template for university presentation websites. It could have more pages included.